Led by guitarist Jack Frost, SEVEN WITCHES has been one of America's best classic 80's-inspired metal bands - specializing in American traditional power metal, reminiscent of bands such as HELSTAR, MANOWAR and METAL CHURCH. And on September 18th, the group will be issuing their latest album, The Way Of The Wicked, via the ILS Group (and mixed and mastered by Joey Vera of ARMORED SAINT and FATES WARNING), which has been preceded by a video for a standout album track, "Better Days", which you can check out now on KNAC.COM right HERE. Comprised of Frost on guitar (Savatage, Belladonna, The Bronx Casket Co. Metalium, Speeed), Anthony Cross on vocals (Livesay, Shadow Image, Fischel's Beast, Attacker), Ronnie Parkes on bass (Farcry, Cleavage, Tango Down, Reece, Bonfire) and Johnny Kelly on drums (Type O Negative, Danzig, Pale Horse Named Death, Seventh Void, Kill Devil Hill), SEVEN WITCHES certainly possesses one of the most impressive pedigrees of any metal band past or present. And the metal community is taking notice of the band, as evidenced by over 3,000 "likes" on the band's Facebook page, while metal-archives.com praised the group's earlier album, Call Upon The Wicked, by saying, "This is a must-own in all facets, and if the true meaning of power metal is ever in question during your moments of introspection this will shut tight any doors leading you astray, that I can guarantee." 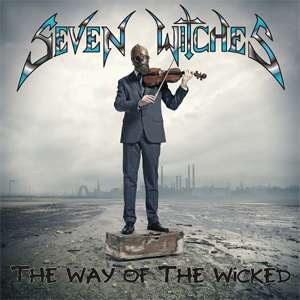 Soon, the rest of the world will get to experience the mighty metal of SEVEN WITCHES. "The Way Of The Wicked"